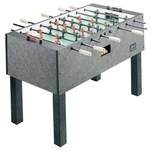 The Shelti Foos 100 is one of the lower-end tables on the Shelti line. 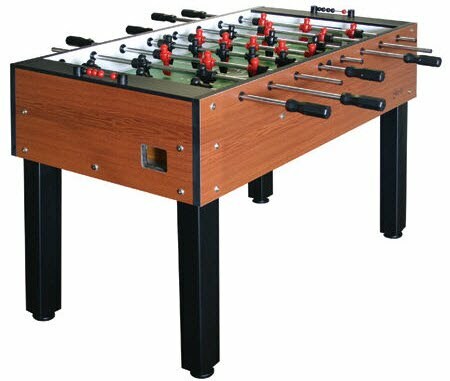 The one downside of the 100 vs. the next step up to the Foos 200 is the lack of counterbalanced foosball men. Counterbalanced men are important for 1 on 1 games where you can just tilt your men horizontally and they will stay out of the way. Without this feature, you have to tilt the men all the way upside down and their heads get in the way of shots that lift off the table. They also tend to fall down and you will constantly be repositioning the foosball men on your offensive bars in order to take shots from the defense.